High temps make for thirstier trees. Please water! Late Monday, June 12th, as the day’s 95-degree temperature tied the 2002 record for this date, Casey Trees sent an alert reminding residents to water their trees. This is especially critical for any trees planted less than three years ago, and for the trees in the tree box areas in front of our houses. You’ll thank yourself in future summers when those full-grown trees shade and cool the concrete sidewalks and asphault streets. 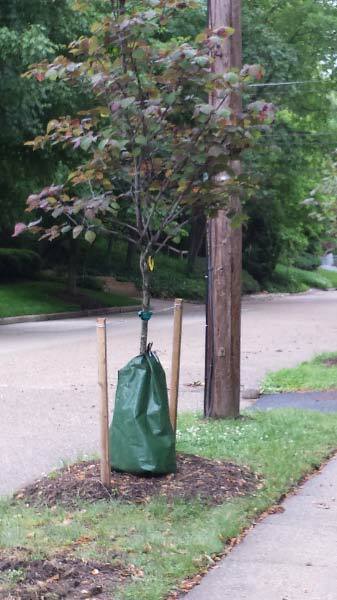 If you have a tree with a green plastic bag around it, that means it needs to be watered every week throughout the summer and into the fall unless we have a good soaking rain. That does not include downpours. And in this heat our young trees are particularly vulnerable. So be kind to those new trees, and fill that green bag with water. If you don’t have a hose long enough, ask to borrow your neighbor’s. Sometimes the holes in the bottom of the bag get clogged. If your tree’s water bag doesn’t empty in five to nine hours, poke a few holes with a sharp implement.